Reducing the density to zero, the equation gives us the same dispersion relation as that of the sound wave as . For short waves ( ), since the wave is ordinary oscillatory wave. Increasing the wavelength (decreasing the wavenumber), becomes negative for . For negative , can be written using a positive real . In this case, since , the wave which has increases its amplitude exponentially. This means that even if there are density inhomogeneities only with small amplitudes, they grow in a time scale of and form density inhomogeneities with large amplitudes. which is called the Jeans wavelength. 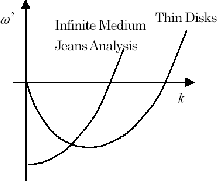 Ignoring a numerical factor of the order of unity, it is shown that the Jeans wavelength is approximately equal to the free-fall time scale (eq. [2.26]) times the sound speed. The short wave with does not suffer from the self-gravity. For such a scale, the analysis we did in the preceding section is valid. Using again the above typical values in the molecular clouds, , , the Jeans mass of this gas is equal to .